AP ECET 2019: Andhra Pradesh Common Engineering Entrance Test is conducted by Jawaharlal Nehru Technological University, Ananthapur on behalf of APSCHE (Andhra Pradesh State Council of Higher Education). Latest Update: AP ECET 2019 Admit Card Releasing Date and Exam Date have been Revised!! Check the Updated Schedule Below in the table. Latest Update: AP ECET 2019 Application form is available from 18 Feb. Check the procedure and last date and fill it. Latest Update: AP ECET 2019 Notification has been released. Check the details and notification just below. Latest Update: AP ECET 2019 Exam date has been released. The exam will be conducted on 19th April 2019. AP ECET 2019 is a state level examination to give admission in Under Graduate Programs. It is for the Diploma Holders of Engineering, Technology, Pharmacy and B.Sc. (Mathematics) in order to get admissions in lateral Entry in BE/ B-Tech / B.Pharmacy courses in the state universities of Andhra Pradesh. Releasing of notification for admission is in the 3rd week of February, 2019. In this report, you will find the detail information on AP ECET Exam 2019. The Notification of AP ECET 2019 will be available in in the 2nd week of March 2019. After it all the dates and events will be confirmed. Now, We are here, providing tentative table of Events and their Dates. The Application form will be available in the 2nd Week of March and you can fill it till the 3rd week of April. There are some AP ECET Eligibility Criteria and Candidates have to fulfill them. If you failed to fulfill the Eligibility Criteria then you will be not allowed to appear in the exam. Applicant must be a Resident of India that is Citizenship should be Indian. The applicant must be a local of state and have proof as Domicile for the same. Qualifying Exam: An Applicant must have Diploma in B-Tech related branch/ Pharmacy related branch from the State Board of Technical Education or equivalent or one should have passed the BSc (3years) degree with Mathematics as its Compulsory subject may also apply for the same. Minimum Marks: It is required to obtain 45% in qualify exam to be AP ECET Eligibility 2019 and 40% for reserved categories like OBC, SC, ST or PWD. Age Criteria: The candidate must have 16 years of age to apply the AP ECET 2019. AP ECET Notification of AP ECET 2019 will be released in the 2nd week of March 2019. After it all the dates and events will be confirmed. The Application form will be probably available in the 2nd Week of March and you can fill it till the 3rd week of April. We are providing here procedure to fill the AP ECET 2019 Application Form. First of all you should go to the formal website of AP ECET 2019. Once you are the website go to the AP CET2019 link. Click on it and it will redirect you to the page of Application form link. Next step is to open the application form link. First option will be the fees payment through Aponline Transaction (if you are paying your fees in cash) or through Credit/ Debit Card / Net Banking. The next thing you do is provide details of the qualifying examination i.e. 10+2 , like marks memo, hall ticket number etc. After that you have to give details of the 10th class i.e. marks, hall ticket number, passing certificate, etc. Now you have to choose the course (Subject) for the Entrance Test. Then you have to enter details of the birth district, Birth state and Date of Birth. Now you have to upload certificate which supports your local thing. No need in case of non-local. The next thing you do is provide income details of your parents i.e. annual approx. Now you have to provide the Reserved category as well as PWD proof if you are one of it. Now you have to provide Adhaar Card and Ration Card Details. Upload passport size photo not more than 50 kb and signature not more than in 30 kb. Both has to be in.jpg format. Now Submit AP ECET Registration Form/ Application Form 2019 . If you have submitted wrong information by mistake , there will be a correction for application will be available . You can correct it. For correction date refer 2019 Important Dates. Once you did correction and submit and take print out of the form for future refrence. After filling the application Form everyone will search for Exam Pattern and Syllabus that’s why, we are also providing here the exam pattern of AP ECET 2019. The Exam will be conducted through the Computer based Online Mode. Syllabus for Engineering: Core Branch Subject with Mathematics, Physics, and Chemistry. Syllabus for Pharmacy: Pharmaceutics, Pharmaceutical Chemistry, Pharmacognosy, Pharmacology. Syllabus for BSc (Mathematics): Mathematics, Communicative Ability and Analytical Ability. Start to plan your syllabus how you going to cover it. Make Time Table for covering entire syllabus. Time Management is important to cover entire syllabus in given time. You have to be fast and précised to score high in entrance exam. Do eat and drink healthy. Implement AP ECET Preparation Tips. 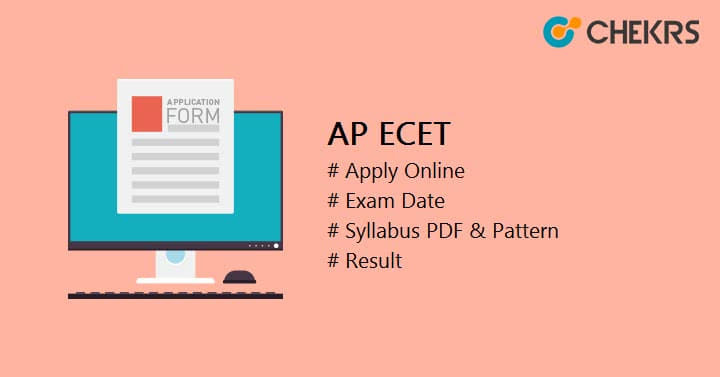 AP ECET 2019 Sample Papers are important for you to prepare for the exam. They help you to cover the entire syllabus. Some topics are not given in the books but asked in previous papers, which will help you to prepare topics which are not in the book. Online Mock Test helps you to know how well you are prepared. It will improve your speed and accuracy. It will give you the Idea of your weak and strong topics before the exam. Once you filled the form the next important thing is to get the Hall Ticket for examination. For AP ECET Hall Ticket you must visit the formal website link which is given below. Click on Hall Ticket Link to download it. Take a print out. Paste your same photo which you uploaded in the form and sign. Keep it safe for the examination. AP ECET Answer Key 2019 will be released by the exam authority; The Answer Key will be accessible on the official website, in the 1st week of May, 2019. It will be available after 3 days of exam date. Candidates can download the answer key from the official website and compare their response to estimate the result and marks. The AP ECET Result will be accessible on the formal website i.e. in the 2nd week of May, 2019. Candidates can check their state rank and score card from the Official Website. On the Basis of the result AP ECET Merit list and rank list will be also released on the official website. Candidates will be called for counselling on the basis of their Rank. The AP ECET Counseling is very important to get you admission seat as it is the final process of the admissions. You have to attend counseling based on your rank in the AP ECET 2019. There will open counseling if the seats are vacant after all rounds of counseling 2019.